Okay, I'm a guy, which automatically means I like Rambo. 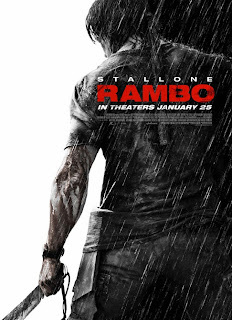 Rambo is one of those classic action characters outranked only by one Mr. John McClane from the Die Hard series. Most people think that Stallone is too old to be taking on his iconic ex-green beret action hero one last time. I disagree, Stallone is in his sixties, but he's in better shape than I will EVER be, so give the guy a break. This time we find John J. Rambo living as a bitter snake wrangler in Thailand. Occasionally he rents out his boat to travel up river to certain areas of the jungle, save for Burma that is. Well, some Christian missionaries come to ask Rambo for a ride into the war riddled Burma. Reluctantly Rambo takes the group into the Burmese jungle. I don't think I need to type the expression for you to figure out what happens from there, but I'll give you a hint: it involves something hitting a fan. Soon the pastor of the church that the missionaries are from comes to tell Rambo that the group is 10 days late from returning and haven't contacted the church at all so something bad had to have happened. This church does the right thing, they hire mercenaries. Let me repeat that. The CHURCH hires MERCENARIES to go rescue their missing missionaries, however, they need a boatman. Cue Rambo. From there on it's pretty much a standard Rambo flick, running through the jungle, setting up traps, shooting fools, shanking fools, bow and arrowing fools, etc. Stallone directs the fourth installment in the popular series, and I'm not sure how I feel about it to be honest. I like Rambo, don't get me wrong, but it's a violent violent film. Stallone has said that he made the film so gory to call people's attention to the genocide that is happening in Burma as we speak. I understand that to a certain extent. What's happening in Burma isn't right, but is Stallone sending the right message to his audience? Do the ends really justify the means in this situation? Sure we would like it to stop, but is that how we would like it to stop? All in all, Rambo is a great action flick, but in the end is too bloody for me to really recommend to anyone.